Harris dry rooms provide advanced design features to achieve low dewpoint control for your moisture sensitive material processing. Our dry room experience dates back to providing lithium battery dry rooms and pharmaceutical dry rooms for hygroscopic materials since 1976 with over 100 dry rooms built worldwide. 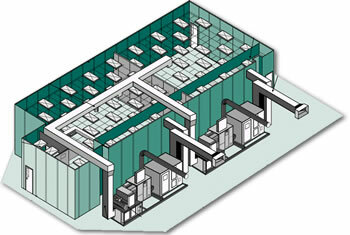 By utilizing our DH Series systems with integral HPX desiccant rotors, and custom refrigeration systems, the user of Harris dry rooms obtains dewpoints as low as –6ºC/-76ºF along with the single-source quality guarantee unsurpassed by local contractors or dry room brokers attempting to provide turnkey solutions. The Harris single-source quality guarantee is our “mantra” – we only offer it because we know we can conquer any dry room challenge presented to us.